Road pricing is not a "stealth tax" on drivers, Tony Blair has said after 1.8m people signed an anti-toll petition. In an e-mailed reply to the signatories he wrote that no decision had yet been made on pricing, but the aim of a scheme would be tackling congestion. Funds raised by pilot projects would be spent on local transport, he added. The prime minister's reply will be sent to all the 1,792,116 people who signed the petition on the Downing Street website - which closed at midnight. It was set up by Peter Roberts, a 46-year-old account manager from Telford, Shropshire, who says tolls are "sinister and wrong" and unfair to poorer people. Mr Roberts said he welcomed Mr Blair's response but would have preferred a moratorium on road pricing while alternatives are considered. The petition appears on a section of Downing Street's website set up in November to allow anyone to address and deliver a petition directly to the prime minister and calls for the scrapping of "planned vehicle tracking and road-pricing policy". In his e-mail response, the prime minister said: "Congestion is a major problem to which there is a no easy answer. "Let me be clear straight away: we have not made any decision about national road pricing. Indeed we are simply not yet in a position to do so." But he said that allowing congestion to grow unchecked "would be bad for businesses, individuals and the environment", costing an extra £22bn in wasted time in England by 2025. He goes on to say: "I know many people's biggest worry about road pricing is that it will be a 'stealth tax' on motorists. It won't. Road pricing is about tackling congestion." He said local schemes would "teach us more about how road pricing would work and inform decisions on a national scheme", adding that "funds raised from these local schemes will be used to improve transport in those areas". 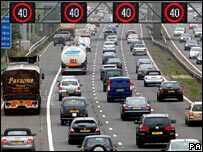 On Tuesday, Mr Blair's spokesman said the government would press ahead with 10 road-pricing pilot schemes in 10 locations around the country. His successor, Douglas Alexander, has since suggested that road pricing could be brought in within a decade. "We've got two policies, the first in terms of a national system of road pricing is that we have a debate ahead of a decision which lies some years away," Mr Alexander said. "What we are planning on taking forward in the mean time, however, is a number of local pilots of congestion charging and we've already made clear that every penny of the money raised by those local congestion charges would be used to improve transport within those communities." The e-mail comes after 74% of the 1,006 people questioned for a BBC-commissioned survey said they were opposed to charging motorists by the mile. Mr Roberts said the poll was more evidence that people were wary of road charges. He also said investment should be made in the transport network without a road-charging scheme.